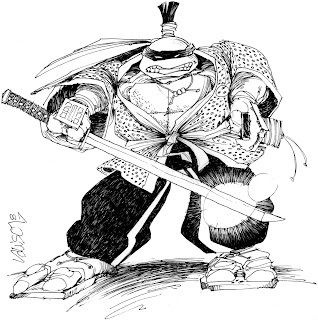 Peter Laird's TMNT blog: Blast from the Past #182: Jim Lawson "Samurai Turtle"
Hmm... reminds me of Usagi Yojimbo. Jim, maybe you should draw an updated version to show how far your technique has come since then. -->> Spare the drama !! He's make a wonderful Playmates fig. Heck when was the last Lawson inspired toy produced. Best i can figure it was the Planet Racers Bike and Nano. anything beyond that i am not sure. Yeh Dan is right, update this so a toy can be made. Funny thing, today i was reading Tales of Leo! This stuff is awesome, I love seeing this great past work. So if you don't mind my asking Jim why don't you like your past work? -->> Similar to effect of ' Bade Biker ' ?? Usagi-san better watch out for THIS Leo! When I was a kid I think I copied this drawing about 5 times. I learned a lot! This is one of my favorites of Jim's. I can see what you're saying Jim, but I think this is a rather good peice anyway. Its very stylized and there's something about the detail of the necklace I like very much.